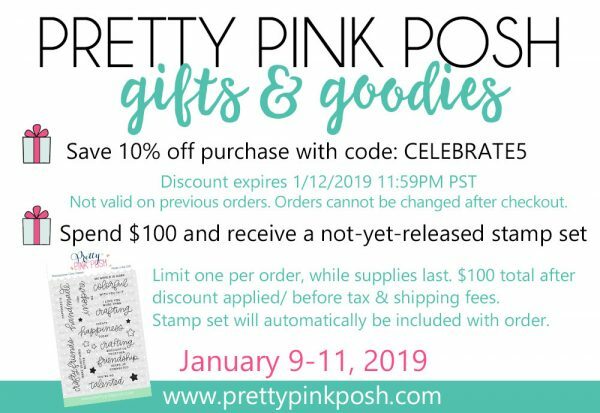 Welcome to my stop on the Pretty Pink Posh hop! Paulina is celebrating 5 years – she’s just 6 months behind me, I just realized we started our businesses half a year apart! 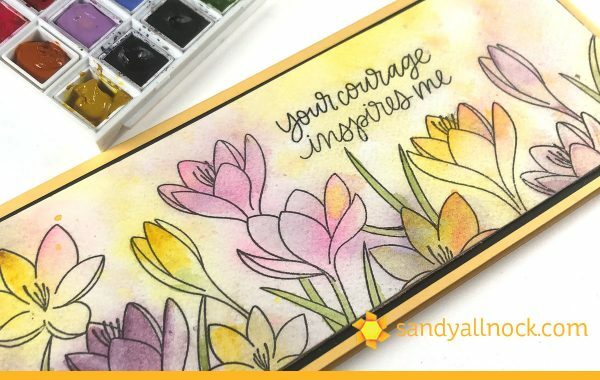 My project uses the Crocus Flowers and Courage sentiment – in loose loose watercolor! 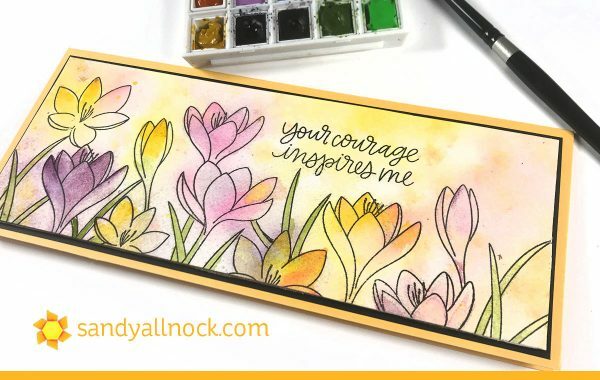 If you’ve struggled with loose painting, I’ve got some encouragement in the video that might shake you from being so tight! 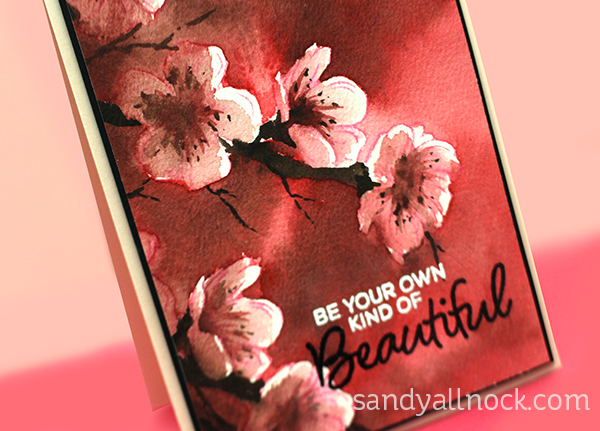 Paint a loose background – then if you paint out of the lines it really won’t matter at all. It’ll just be some extra pretty splatter! 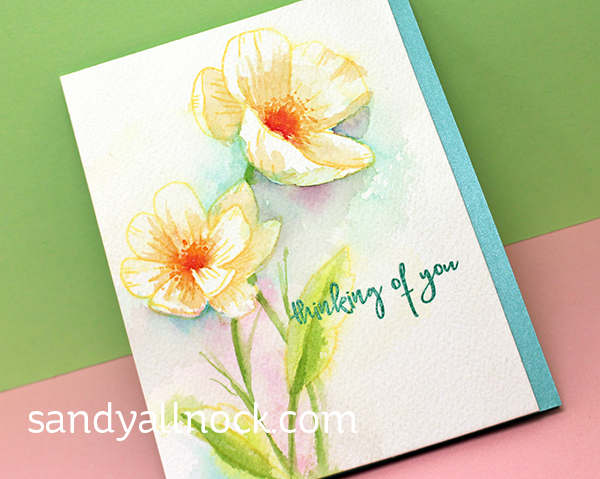 If you need something different to shake you up creatively, try a different format for a card – long skinny, 5×7, something other than your usual! 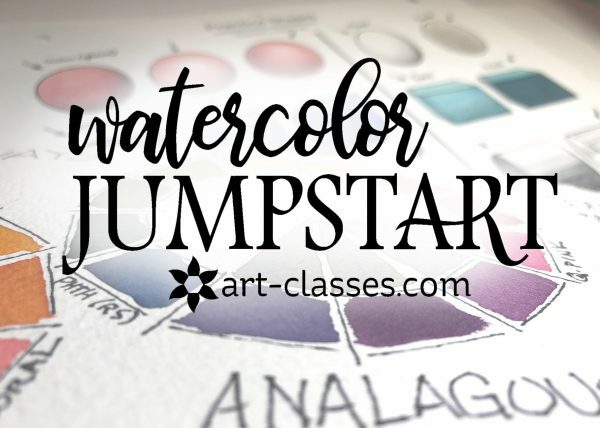 Be careful using gouache-tupe pigments that are opaque or semi-opaque; if they cover the black stamped lines, use the paint in a thinner fashion. “Tea” as we’d say in Watercolor Jumpstart Class! 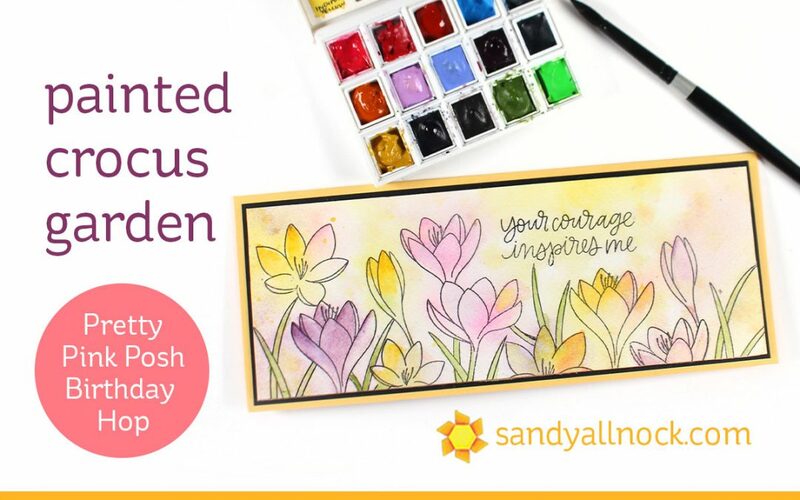 Public Service Announcement: A follower recently mentioned something odd going on with purchasing Daniel Smith paints at some Michael’s stores – forcing customers to buy multiple tubes of a color in order to get a particular price, saying the manufacturer requires it. That sounded too weird, so. I checked in with my friends at DS; they hadn’t heard of this, but are tracking down the source to be sure that stops. If you’ve had this experience at a store, can you email and let me know? Of course you’ll want to leave comments on the blogs for prizes right? 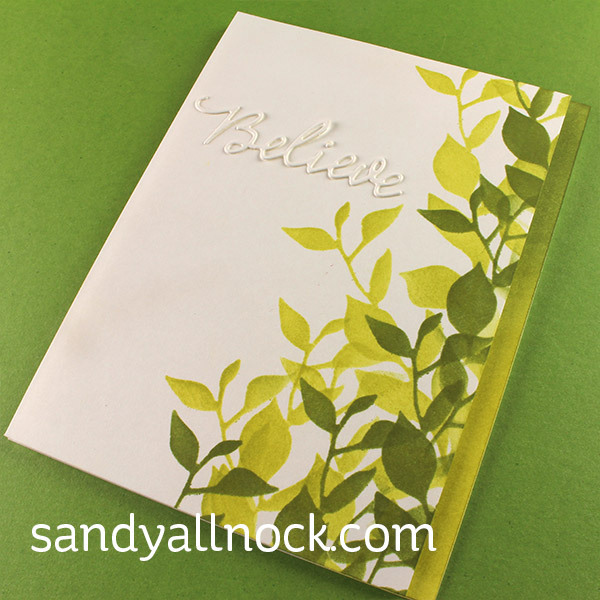 Paulina is giving away $25 gift certificates to NINE people who comment during the blog hop. NOTE: another post (no video) will be live at 9…be sure to pop back in! 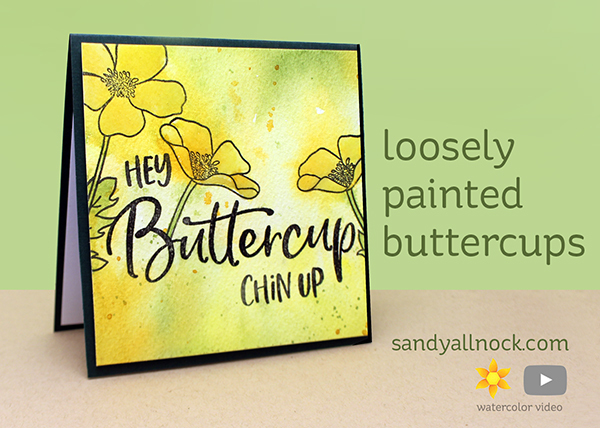 Loosely Painted Buttercups: Easy watercolor! 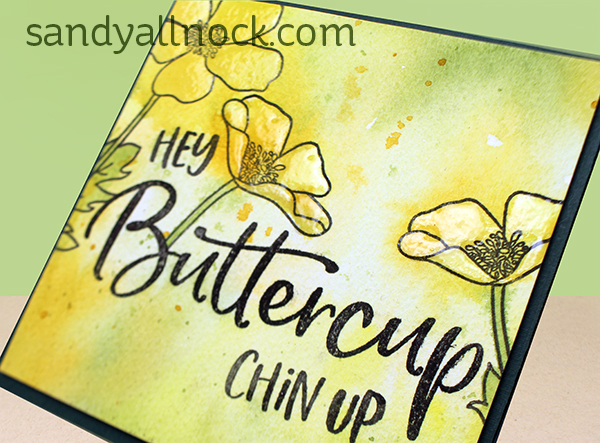 A while back I shared how to loosely paint poppies HERE – today it’s buttercups! 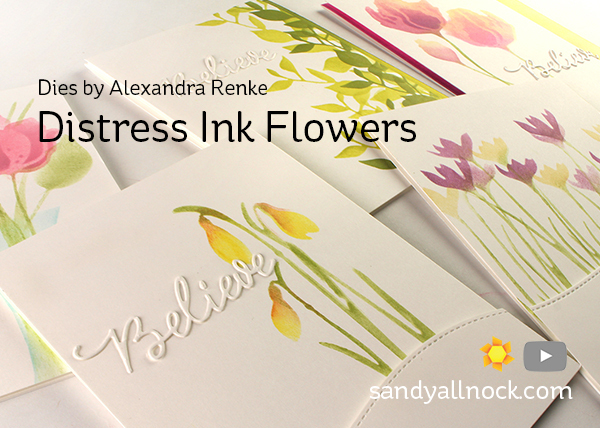 You knew I had to have this stamp set with yellow flowers, right!?? Watch the video below or click HERE to see it in HD on YouTube. 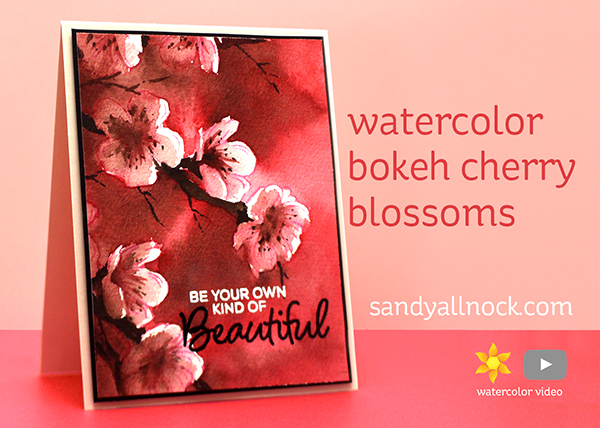 Recently I created a bokeh background for Mondo Sakura (also cherry blossoms) in Copic Marker. 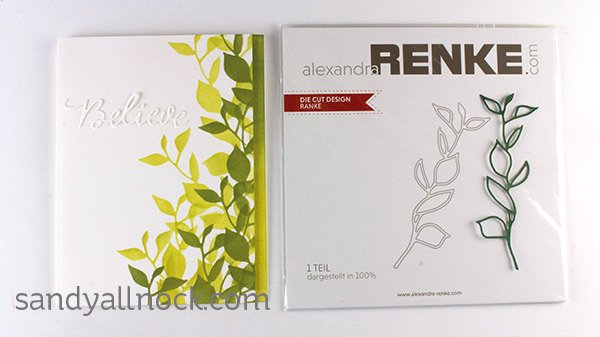 So I thought – look, here’s another pretty cherry blossom stamp set, why not see if I can pull it off in watercolor? Watch the video below or click HERE to see it in HD on YouTube. 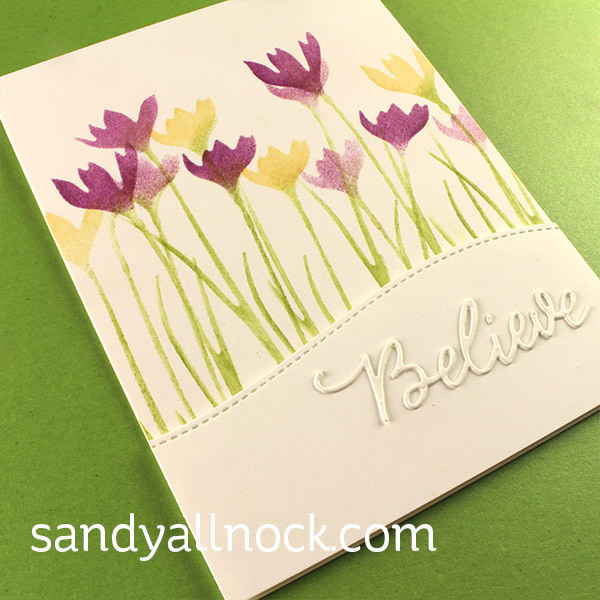 Crocuses die – beautiful elegant flowers, and I paired it with a Lawn Fawn stitched hillside die – some of you might see it as snow since we’ve had such crazy weather in the beginning of spring this year! 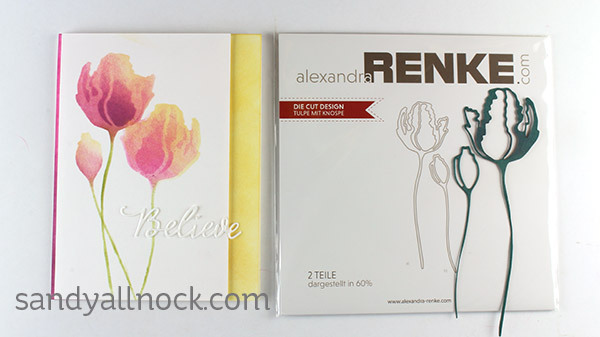 Tulips…I love the ones with the ripply edges! 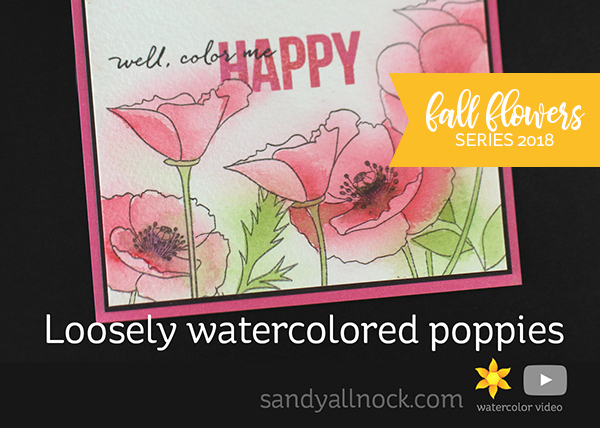 Poppies – and in the video I show you a simple way I figured out to make a vase with a little Tumbled Glass ink. 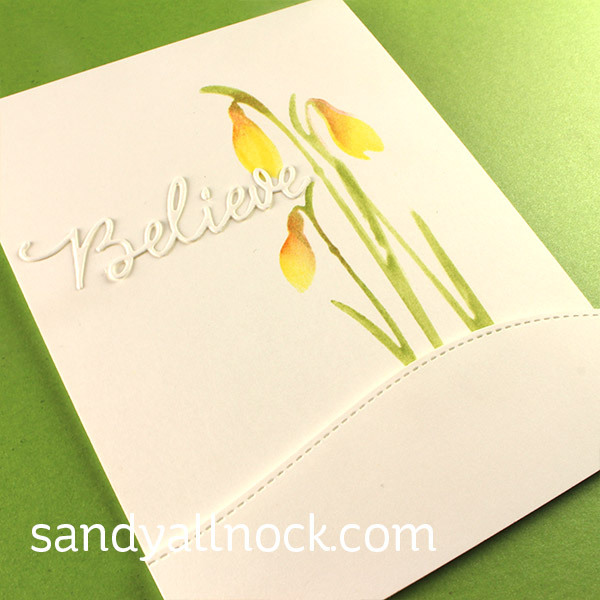 Snowdrops….I’m hoping they’re yellow, because aren’t they sweet in sunshiny yellow?? 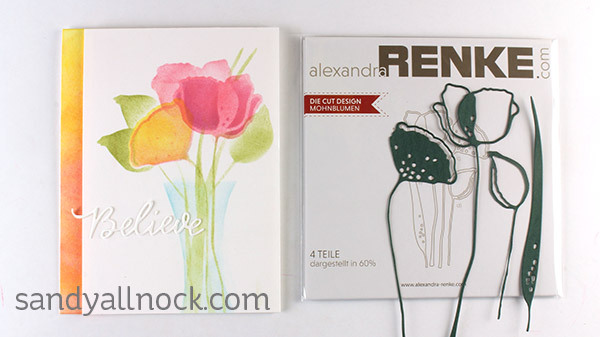 Welcome to my stop on the Avery Elle Watercolor Bloghop! 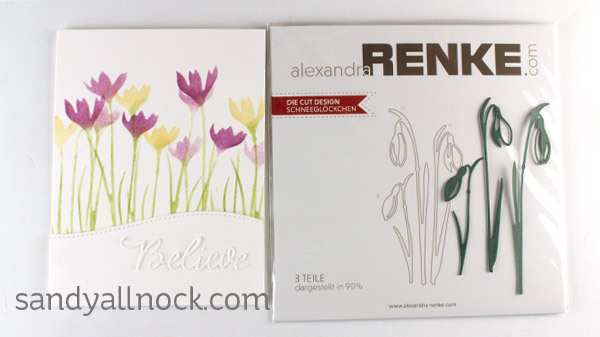 So much exciting inspiration to be had….so let’s get to it! Bloghop details and supply lists are at the end of the post. Let’s go paint! 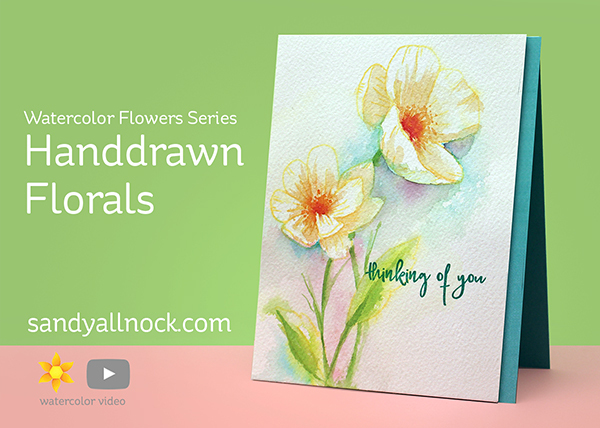 I’ve been doing floral watercolors for quite some time now – there’s a giant playlist you may want to go sit through sometime if you haven’t yet. Tons of techniques! 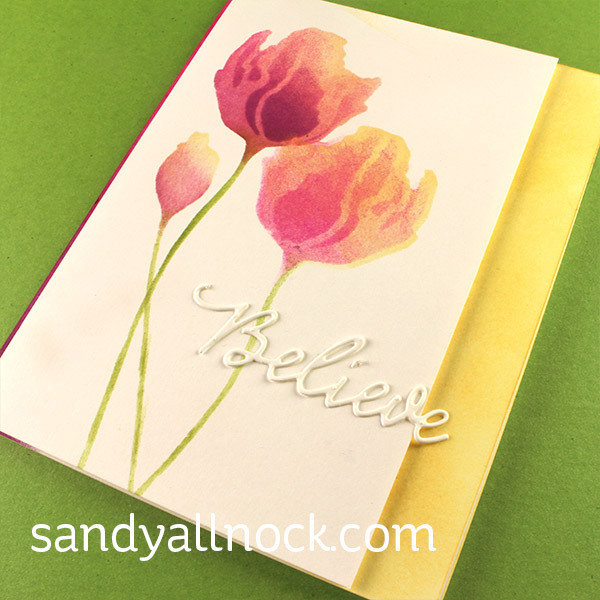 This one creates a very soft look with washy layers, over images stamped in Avery Elle Daisy Pigment Ink. Watch the video below or click HERE to see it in HD on YouTube. 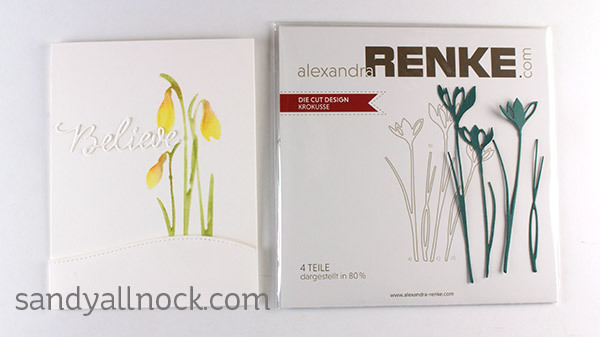 The finishing touches on the card were to trim the panel to 4″, then pop it onto a card base using dimensional adhesive. 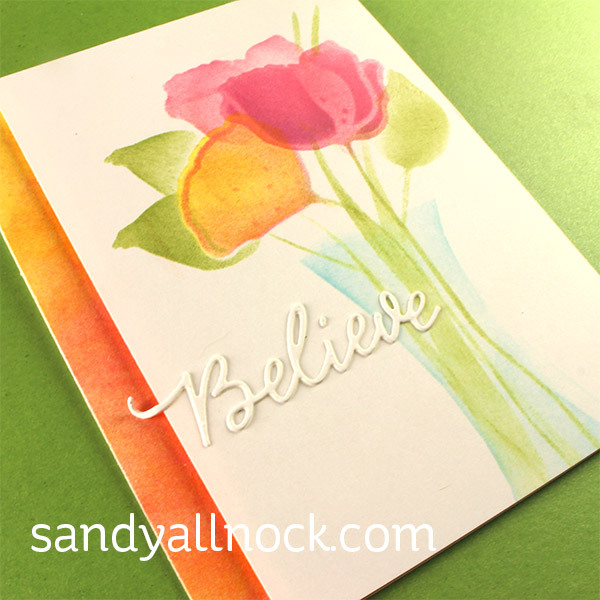 I also stamped the sentiment in Avery Elle Mermaid ink and clear-embossed over it. Here’s the chart I made recently of the colors….go pick some favorites and get busy painting! I’m the last stop on the hop – so you’ll want to go join in from the very top.